Does your Jaw pop or click every time you open and/or close your mouth? Do the muscles in your face hurt or tire easily? Does your jaw or TMJ area hurt when you are trying to eat even the softest of foods? 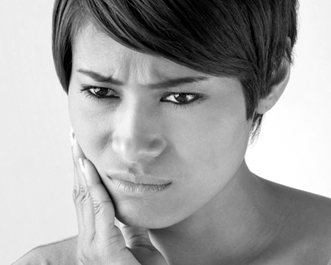 YOU COULD BE SUFFERING FROM TMJ ISSUES. TMJ is what most patients call problems of their jaw joints; however, TMJ actually refers to the joint itself. Temporomandibular joint dysfunction (TMD, TMJD) is a term which describes the dysfunction of the muscles of mastication (the muscles that move the jaw) and the temporomandibular joints. There are many symptoms associated with this disorder. Many of which most patients would not even think of being related to their jaw joints. The most common symptoms that a patient can develop are pain, followed by restricted mandibular movement, and noises from the temporomandibular joints (like pops or clicks) during jaw movement. 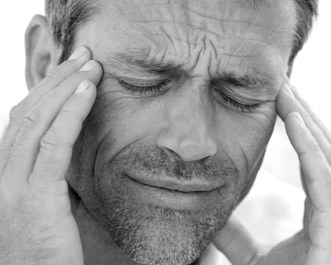 Other symptoms that most do not associate with TMD can be tinnitus (ringing of the ears), clogged or congested ears, headaches, neck pain, grinding, clenching, fracturing of teeth or restorations, and neck pain. It is important to understand that patients may experience one or all symptoms when suffering with TMD. 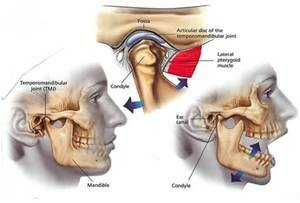 Temporomandibular joint dysfunction is a complex disorder that is thought to be caused by multiple factors. Although TMD is not life-threatening, it can definitely effect a person’s quality of life due to the symptoms becoming chronic and difficult to manage. Dr. Tracy Davidian is revolutionizing the way TMD is treated throughout North Carolina. Dr. Davidian takes a holistic approach by considering your medical history, and a physical examination of your head, neck, and teeth. She will conduct a series of tests and use the data to determine whether your bite is a factor. If these tests show that your bite is a likely cause of your pain, Dr. Davidian will then identify a new position for your jaw, based on the relaxed state of your jaw muscles and position of your lower jaw. The most common treatment types include exercises, trigger point therapy, laser therapy, orthotic (bite splint), braces, and/or porcelain crowns. She will work with you to customize your treatment to ensure your symptoms are lessened or taken away completely. In less severe cases, Dr. Davidian recommends a custom-fit oral device, or orthotic, made of clear acrylic. This easy-to-wear orthotic fits over your bottom teeth. It is easy to speak with and not visible to others. For patients with more severe TMJ Disorder, Dr. Tracy recommends a fixed orthotic be worn for several months to help eliminate symptoms and re-establish TMJ health. A fixed orthotic cannot be taken out like a removable orthotic, and it blends in with your natural teeth making it virtually invisible. If you show any of these symptoms, a neuromuscular dentist, like Dr. Tracy Davidian, might be able to help. Most patients associate a TMJ problem with noise. “My jaw pops and clicks. 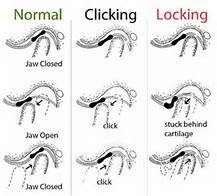 I know I have a TMJ problem”, is what most patients say to me. 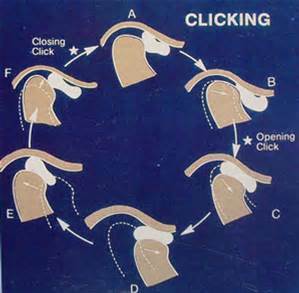 In order to understand why you jaw pops and clicks, you must first understand what a “normal joint” looks like. Definition: Displacement of the TMJ articular disc when a persons back teeth are closed together and reduction (mandibular condyle back underneath the disc) of the disc on mouth opening. Definition: Displacement of the TMJ articular disc when in centric occlusion and reduction of the disc on the mouth opening with intermittent inability to reduce the disc. 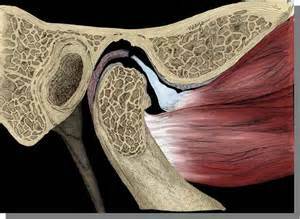 Definition: Displacement of the TMJ articular disc when in centric occlusion and in all movements of the mandible with restricted range of motion and deflection of the mandible to the effected side. 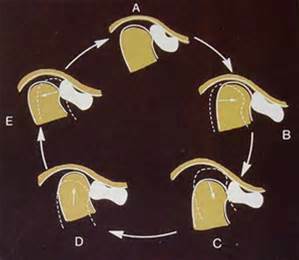 Definition: Displacement of the TMJ articular disc when in centric occlusion (back teeth touching and together when closed) and in all movements of the mandible with or without restricted range of motion and deflection of the mandible to the affected side.